You must be a member of the Yerevan Hiking Armenia Group to attend this activity. Would you like to join this group? Lets have a kash party as it is winter and we can do hiking later on in Yerevan: Republic Square, Northern Avenue, Cascade till Monument park then who wants to stay we can go to carousels. 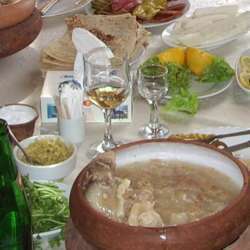 As Kash is Armenian traditional food and need long time for digestion we shall have our food in the morning/afternoon.